Another TabCo story. 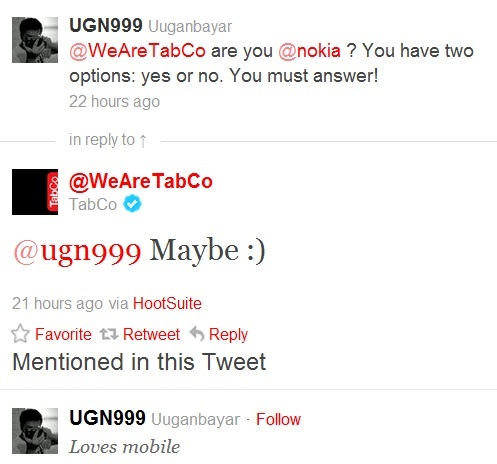 @UGN999 tweeted me that he asked Tabco’s twitter one of the questions they specifically forbid being asked in one of their Q&A sessions, “Are You Nokia?”. further fueling the straw clutching abilities of Nokia fans with each and every TabCo post. Are TabCo folks just clever in that they know they’re getting a lot of attention from folks wishing this was Nokia even though they aren’t? I would so hate this to be anyone other than Nokia. There seems to be equal amounts here feeling it is Nokia to those doubtful. Well, 15th August is when we’ll find out.